Here's our list of best snorkel masks on the market in 2019. Cressi has done it again! The F1 Frameless Mask is made of 100 % silicone being a stronger, longer lasting material than PVC plastic. It is lighter, lower in volume and more compact that your standard mask making it ideal for traveling and being in the water, almost feeling like your wearing nothing on your face at all. The single window lens is made of high quality tempered glass with an anti fog built in. The single window lens has an opening over the nose to not restrict view but also reduce pressure sometimes put upon the top of the nose in between the eyes. The silicone skirt is hypo allergenic to prevent any issues with the delicate skin of the face. The double seal system makes it even tougher for water to get into the eyes. The mask comes in a variety of solid colors in which the skirt will block out reflective light when you are in the water. Strap buckles are attached directly to the skirt creating more movement throughout the mask to your face and flattens easily with the chance of break when you are packing it into confined areas. The ratchet design makes it easy to tighten and loosen when you need to. The Aegend is one of the most comfortable masks out there. The liquid silicone skirt is environmentally friendly and harmless to the body. The wide angled tempered glass give you 180 degree panoramic vision to provide you with a phenomenal view. The lens do not have any artificial color or tinting to obstruct your view. It also provides you with UV protection for your eyes and with anti fog it will leave you seeing well into the future of your dives. The tempered glass is shatterproof for your safety and offers a hassle free 12 month guarantee. The silicone skirt is so soft that it doesn't leave marks on your cheeks, forehead or crest of your nose. The straps are easy to tighten and loosen with a quick push button to release and a quick pull of the strap to tighten making it effortlessly whether you are in or out of the water. It comes with a loop around the straps so after tightening your goggles you don't have the straps floating around your head obstructing your view and causing any annoyances. Only coming in the color blue, it comes with a carrying case to ensure you do not scratch the lens and making it easier to travel to your destination. Also when you are on the beach it provides protection so you do not get sand in the lens causing issues when you are about to go snorkeling as the small sand grains could rub against your face. 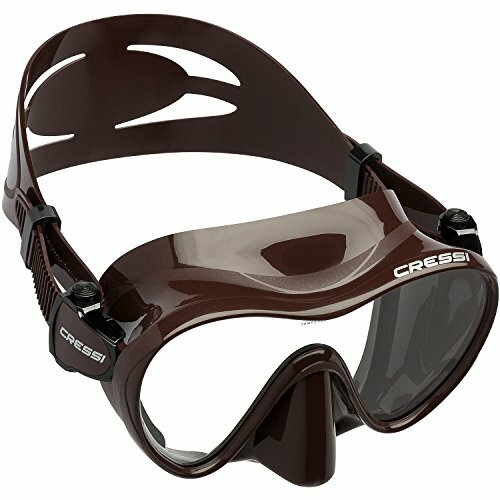 Cressi has been on the leading edge of water sport gear since 1946 and the Cressi Marea scuba snorkeling dive mask is one of the best. Having a few more features than your basic mask to get you in the water and see the ocean or lake for the first time, this mask doesn't block side vision (unless you have the black mask) to take it all the water has to offer. The silicone skirt won't let water in and provides a tight, snug fit almost any ones face. Doesn't apply pressure to specific spots such as the nose, between the eyes and cheek bones so you can truly enjoy your time in the water. The tempered glass lens doesn't blotch or smear creating a panoramic view. With the inclined lenses the angle sits closer to the eyes creating a lower field of view and enhancing your seeing ability. It comes in a variety of colors including red, blue, pink, black (including the skirting) and many others. 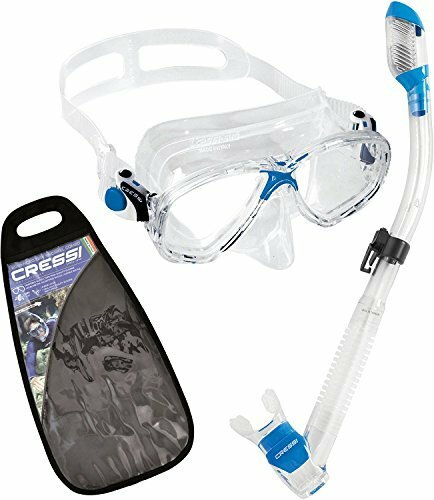 It comes with a 2 year warranty proving Cressi water gear to fully back its design and name. An absolute must with no chance of losing out, a great mask that will get you through countless hours of snorkeling with perfect vision. With so many options including style, colour, shape it is tough to find the right one but comfort is the key issue when it comes to finding the right snorkel mask. If you had all the time in the world and nothing else to do your best bet would be trying on as many snorkel masks as you could but this is reality and you are most likely rushing from one task to another. This will go through a variety of snorkel masks, weed out the cheaply made ones and get you in the water faster. Remember though it is not about the price, what looks cool, and what your other friends may have, it is about being comfortable in the water and finding you the best snorkeling mask for yourself. When first trying on a snorkel mask, before you even put the strap around your head you should be able to put the mask on your face and gently breathe in and let go of the mask. If the mask stays you know you have a tight seal and will not leak. Remembering it is a light inhalation and if you breathe in too much it may defeat the purpose of the test. A couple reminders, especially if you have long hair is to keep it tucked back in a pony tail because even a few strands of hair can change the position of your mask. This also includes facial hair, in which you may have to shave a little back with a full beard. Once you have found that the mask sits comfortably, put the strap around your head and see how it feels. Now if it feels painful as soon as the strap goes around your head you may want to try a different mask. Snorkeling is meant to be fun and if it hurts anywhere around your face it will be uncomfortable and you won't be able to enjoy your time looking at the ocean or scenic body of water you are in. If you find that the strap is pulling at your hair or uncomfortable but the mask feels good, there is an option to buy a strap wrapper neoprene mask cover. They slide over the straps and makes the transition over your head and hair more comfortable. They come in a variety of shapes and sizes that fit most masks and won't add weight to gear or break the bank. Brand new masks usually have a chemical residue on them from the manufacturing plant to prevent scratches or wear and tear before it gets to the store. If you don't have access to anti-fog because you are already on your vacation use tooth paste or baby shampoo on the lenses with something soft that won't damage or scratch the lenses and then rinse with water but not from the ocean water. Anti Fog! You can buy this at most sports stores or your local dive/snorkeling shop. It is as easy as spraying a thin layer onto the inside of the glasses, putting them on your face and jumping into the water. Check with the salesman if the mask is already an "anti fog" mask. Depending on the make and model most masks already have an anti fog instilled into them they won't permanently keep you fog free but will definitely help. If you have tried all of these techniques and nothing is still working for you before or even during your snorkeling experience try this: dip your mask in the water, spit on the inside frame of the lenses, move the spit around without touching the lens with your hand. Quickly dip it in water and put in on your face right away. This should help short term for sure and hopefully long term. All else fails if none of these methods work I think it is time for a new snorkel mask. About 60 percent of the world wears glasses. That will make snorkeling very difficult but there are options. First of all your easiest and cheapest way is to start wearing contact lenses when you are snorkeling but if you are having issues with that you can always buy prescription lenses for your snorkel mask but can get pricey depending on your mask and if the prescription will fit into your mask. Recently there is an alternative being some masks have their lenses removed and can drop in pre-made corrected lenses. It is a good idea to ask your eye doctor and local snorkel shop to see if they are compatible first. Even though you are in the water whether it is the ocean, lake or pool there is still sand, dirt and other tiny particles floating around that can lead to mould or even scum on your snorkel mask. After you are finished you want to wash the snorkel mask in warm, soapy water. Once you have washed the snorkel mask thoroughly rinse it with clean water to get rid of the soap and other particles . Finally, dry the snorkel mask inside and out not to leave any dampness on the mask because it can leave a residue and cause bacteria to grow. Now that you know how to fit, clean and prevent fogging in a snorkel mask here are some options that can help you get on your way. 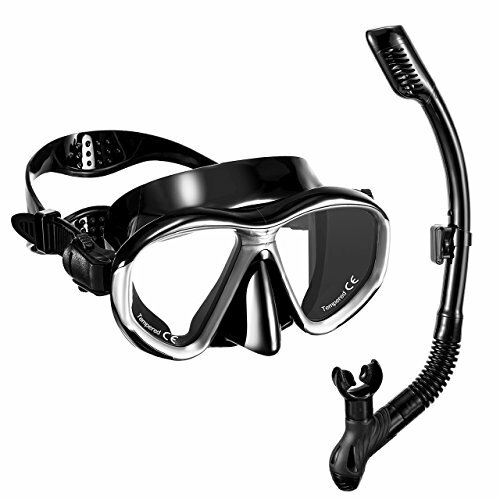 Remembering some mask come with a snorkel so just making sure that it fits your mouth comfortably just like your mask. Along with your fins, snorkel, and any other gear you may need for you snorkeling adventure, seeing may be the most important aspect meaning you want to find the right mask. This can be difficult when everyone has different shaped faces and heads or you need a prescription mask (which I will get to later). One needs to be able to learn how to fit a snorkel mask, how to clean a snorkel mask, one might need a snorkel mask for glasses and even prevent fogging in a snorkel mask. With so many options to choose from along with price, availability, style and comfort this can get quite confusing. Sometimes you will find that a snorkel and mask comes together but other times you will have to purchase them separately. 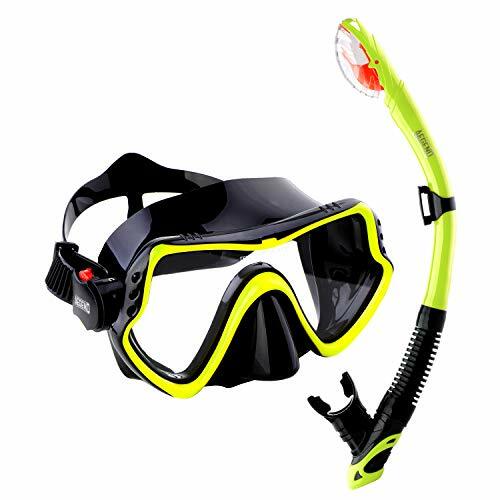 That's why this article will help you narrow your choices and take the guess work out of buying and finding a snorkel mask that is best suited for you - if you want to further explore your options with different types of snorkel, make sure to check our reviews on best dry snorkels. More expensive does not mean better. Just because something is really expensive doesn't mean it is going to be the best snorkel mask. Also cheaper is not always the answer either, meaning you get what you pay for. You don't want to go buy the cheapest mask because you are only going to use it once but if you are going out to see some of the best snorkeling in Oahu for example, you don't want to get there and your mask hurts, its leaking and fogging up, you won't even enjoy yourself. In this section you will learn a few quick tips when picking your snorkel mask to avoid disappointment on the open water. Firstly, there a two main attributes that you will notice right away is the lens (viewing area) and skirt material (what holds the mask to your face and separates the water). You want to make sure that the lens is a tempered glass for safety in which they are durable and won't break from a small drop or even break when you are diving. As for the skirt you want it to be 100% silicone because some are made of PVC (polyvinyl chloride - synthetic plastic) or another cheaper rubber which do not hold a good seal. Having a good skirt and lens makes all the difference but it doesn't stop there, some masks offer a panoramic view allowing you to see more though your periphery giving you a full range of sight into the body of water opposed to a narrow view that you can only see where your looking. There is also a different size when it comes to skirting in terms of having more skirting touching your face. Meaning the more touching your face, the more likely there won't be leakage into your eyes. This doesn't mean the less skirt the worse off it is, it just means that if you are having trouble with leaky masks in the past try more skirting and see if it makes a difference.